Suze is a mediator — a liaison between the living and the dead. In other words, she sees dead people. And they won’t leave her alone until she helps them resolve their unfinished business with the living. But Jesse, the hot ghost haunting her bedroom, doesn’t seem to need her help. Which is a relief, because Suze has just moved to sunny California and plans to start fresh, with trips to the mall instead of the cemetery, and surfing instead of spectral visitations. But the very first day at her new school, Suze realizes it’s not that easy. There’s a ghost with revenge on her mind … and Suze happens to be in the way. I felt so much nostalgia when reading through this. I remember reading these back in elementary school/middle school and loving them so much. And the second time around I love them just as much! Meg Cabot’s writing is so phenomenal. She’s funny, witty, snarky, and really connects with her readers. 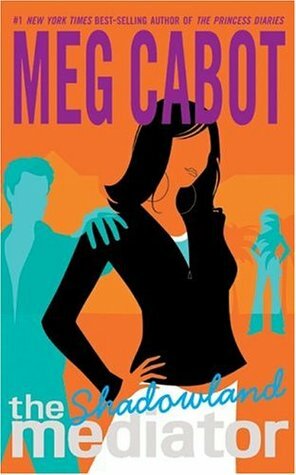 It’s hard to find a writer who actually makes you laugh out loud whilst you’re reading their novel, but Meg Cabot did just that. Of course, I love the premise of this whole series (I mean a girl who not only see’s ghosts but kicks their butts too? Awesome!). I think this may have been the first paranormal/slightly feminist stories and characters, respectively, of it’s time. Can you believe these came out 14 years ago!? Crazy! Anyways, off to read the next one and laugh along with Suze all over again. AND IT WOULD MAKE SUCH AN AWESOME SHOW. The Vampire Diaries would have nothing on this series. Meg Cabot is seriously a gift to YA.